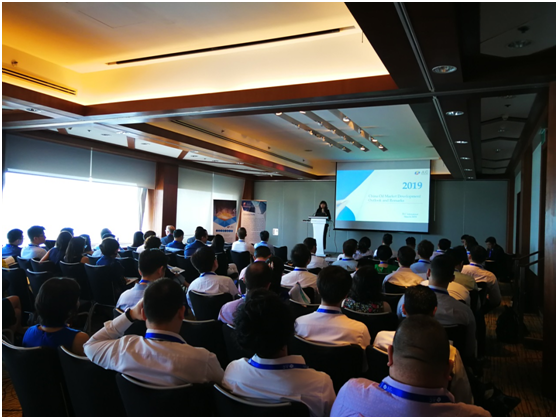 Guangzhou (JLC), March 29, 2019--JLC presented its price assessments at its seventh Oil and Gas Forum in Singapore on March 26 and amazed attendants with a vivid display of the Chinese energy market. As a third party that provides price assessments, JLC sees through market supply and demand and makes trading increasingly transparent and more efficient with its assessments, Mr. Roger Chen, Vice President of JLC, got straight to the point at the forum. He presented JLC’s assessment methodologies from the past 20 years, which amazed attendants from over 10 countries and helped them understand what efforts China had made to harmonize with the international market. Among Chinese commodities information providers, JLC was the first one to launch spot crude assessments. It launched assessments of propylene, ethylene and butadiene as early as in 1999 and started to provide assessments of 72 petroleum products, liquid chemical products and downstream chemical products in 2003. 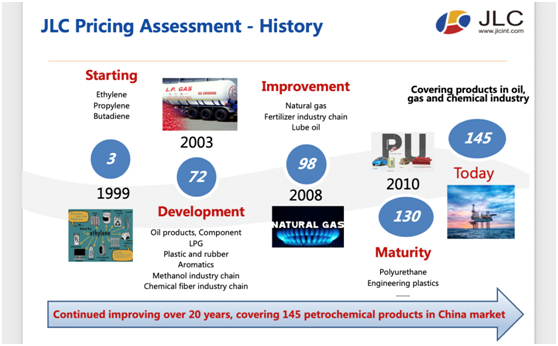 After 20 years of improvement, JLC’s assessments have now covered 145 petrochemical products from the oil, natural gas and chemical industries and have well showed how Chinese energy commodities are priced. Its assessments have been aimed to become the benchmark for China’s spot commodities market. "JLC’s assessment history was also the history of China’s petrochemical industry going from the domestic market to overseas ones since the country acceded to WTO, and the history of localization to globalization,” Roger said. At this forum which attracted over 140 senior traders, analysts, executives and refining engineers from global refiners, trading and finance companies, another topic that aroused great interest was “the Chinese energy market under deepening reforms”, presented by Amanda Zhao, General Manager for JLC’s International & Marketing. By 2025, refining projects in China’s seven large petrochemical bases will probably be online and boost China’s refining capacity by 6.8 million bbl/day, Amanda said. Additional product supplies, such as those from Hengli Petrochemical and Zhejiang Petrochemical, will intensify market competition in both the domestic and overseas markets, as some products will be for overseas markets, according to Amanda. "Meanwhile, as Shandong plans to integrate independent refiners, the number of local refiners will drop significantly in 2022-2025. Only 15-20 refiners may survive in the future,” Amanda said. In fact, the Chinese government pays increasing attention to environmental protection and over 90% of the domestic bunker fuel contains low sulfur, Roger said. 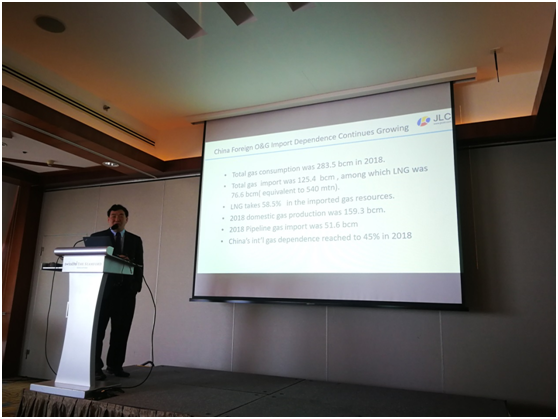 As China’s “green” energy transition (transition aimed to reduce pollution by the energy industry) has also attracted a lot of market attention, JLC’s marketing director Tony Zhou presented an analysis of China’s natural gas market and LNG imports in the coming five years, the connection of China’s gas pipelines, the opening up of its LNG receiving stations and the downstream switch from coal use to gas. He also analyzed the country’s natural gas infrastructure including receiving stations and tanks. The success of the meeting indicates that JLC is boosting its international services and its efforts to build a bridge between domestic and international markets have been recognized by the international oil and gas industry. JLC will provide better and more services to international energy enterprises that tap the Chinese market and keep up with its hard work to become a world-class service provider in bulk commodity trading.